Though they are a Mexican band, this was the first time ever I could see them live, something I wanted to do long ago but for x or y reason I couldn’t do. The main reason I wanted to see them in concert was because I truly love their album “Cuatro visiones” a five star album, 10 out of 10, previously reviewed by myself and one of the best RIO albums my country has ever given. So this time I could see and listen to those tracks in a live version, with a different drummer and an additional live bassist. 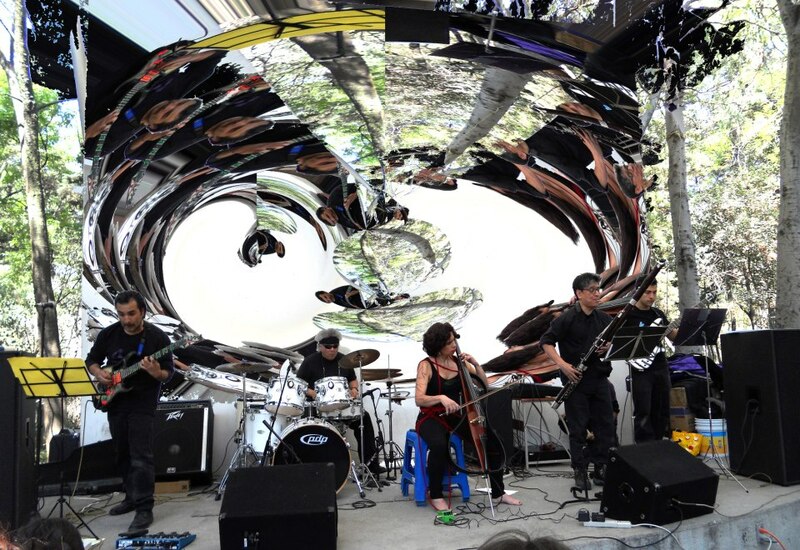 The concert took place in an open air stage, which is not the most suitable for a RIO/chamber-rock band, and that could have damaged their sound in a certain way. So at 1:30pm or so, they welcomed us and began the show. Let me first tell you that Arteria’s music is composed by bassoon, electric cello, guitars, drums and bass, so though the rock element is present, the music tends more to the chamber and rock in opposition side, giving as a result what the band would name ArtDarkRock. So the concert began with a introductory track that opened the gates to the dark atmosphere of “Marcha Funebre”, a song with electric funeral drums that invites us to close our eyes and imagine some life’s pictures, so we become more sensitive and each note they play enter deep in our mind, that’s the result their music produce if we are open to it, if we want to experience our deepest thoughts and feelings. The work of Maricarmen Graue in the electric cello is superb, she knows when to play, she knows the precise moments to give us goosebumps, to scare us and to make us feel relief, what a combination. I must be honest and mention that in the first tracks the band’s as a whole was not that polished as I would have expected, there were moments when one of the was not in time so the sound was uneven, however while the minutes passed they were improving until the sound was perfect, something expected from a band with such wonderful and trained musicians. “Fragmentos cortados” and “Cuatro Visiones” continued the show. Juan Carlos Ruiz is an bassoon expert, the nuances, colors and textures he produces are the main essence of Arteria, and he demonstrated in the show. What this kind of music produces is unique, the people who came won’t let me lie, but once they play, we feel like hypnotized so our ears and mind are completely inside the music, and don’t escape until it finishes and our hands begin to clap. Then they played two or three songs more from their debut album, including “La sentencia” the song that opens it and one of my favorite. Later they surprised us with new arrangements of “Deforme”, and later the show finished with “Un lament y dos danzas” the same that finishes the album. I left the stage happy, it was a cool experience that I last could witness, however I would really love to listen to them in a theatre or an indoor place, I bet there will be even better.